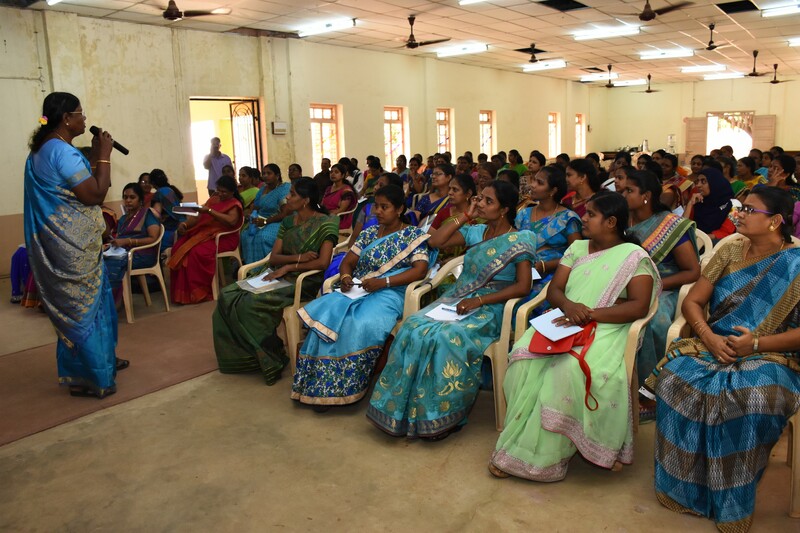 A one-day orientation programme was organized for the faculty members of RSK Higher Secondary School (Managed by Pavai Varam Educational Trust, Rasipuram) at BHEL Township, Kailasapuram, and Trichy 14 on 08.09.2018. “The most valuable resource that all teachers have is each other” and the Human Resource Skills need to be sharpened and enhanced in tune with the expectations of the learning community. With this view in mind the orientation programme was organized and the inauguration of the same took place in the morning on 08.09.2018. 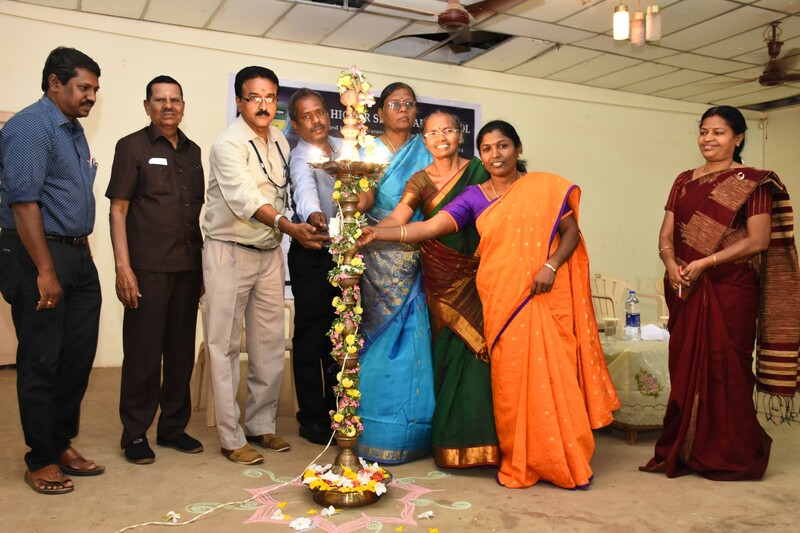 Mr.N.Raviprakash, AGM, IR Law and Admin, BHEL, also the Chairman of RSK School Governing Body, inaugurated and presided over the programme and spoke about the relevance of faculty orientation. He thanked Thiru. CA.N.V. 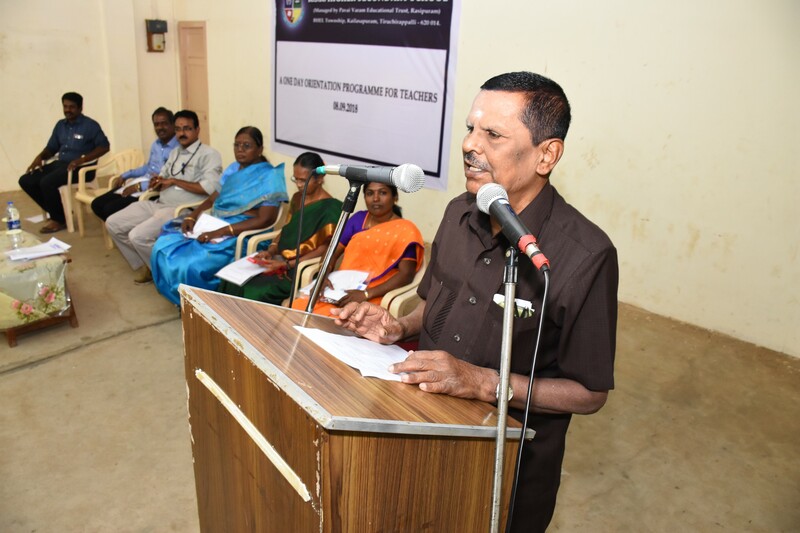 Natarajan, the Chairman of Paavai Institutions for sending the experienced resource persons to share their expertise for the benefit of the faculty members. He congratulated Dr. Pappan, the Administrator and Mr. M. Santhakumar, the Principal for their efforts in organizing the event. Mr.N.Raviprakash introduced the resource persons and highlighted their credentials to the audience. 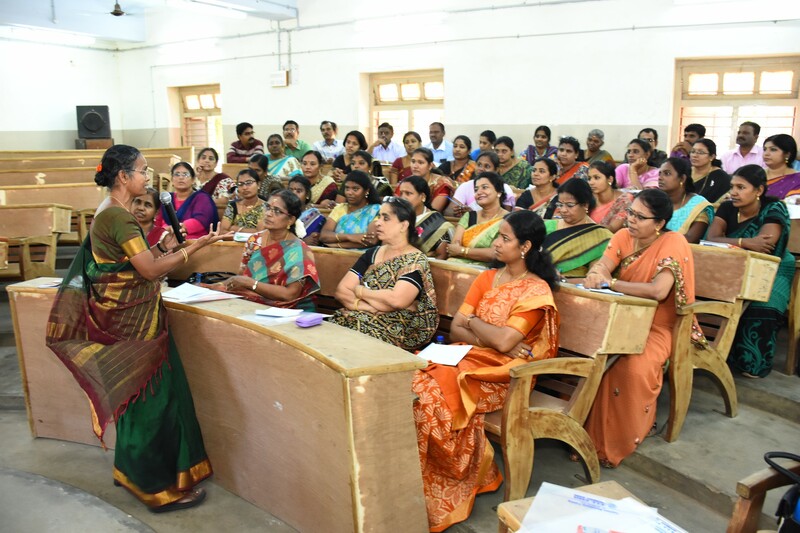 Following the presidential address, Dr. Pappan, the Administrator motivated the teachers and encouraged them to be more interactive during the sessions. Dr. K. Selvi, Dean Academics presented the objectives of the orientation programme. She stated that the faculty orientation is described as “an educational process which involves sharpening of skills, concepts, changing of attitude and gaining more knowledge to enhance the performance of employees”. She said that the main objective is to empower the faculty members to effectively discharge their roles and responsibilities. After the inauguration, the teachers were divided into two teams and sessions were held concurrently. The Main School and the Junior School staff gathered in the Lecture Hall and the staff of the A, B and C sectors remained in the Montfort Hall. Dr.R.Kasthuri Bai, Dean, Faculty Development of Paavai Educational Institutions spoke on the topic “Scores with Moral Values”. She said that instruction does much but encouragement does everything. She hailed that teaching is the profession that creates all other professions. Teachers have to bear with the “Helicopter Parenting” and “Lawn-Mower Parenting” which does not give more scope for independent learning on the port of the students. Therefore, the teachers have to work more in order to empower the learners to think differently and perform creatively. The caliber of a teacher is to turn pebbles into diamonds. She also emphasized that the students are the customers and the teachers should know the demands of their customers. Getting good marks instills confidence in learners and hence the utmost duty of the faculty is to enable all the students to successfully get through in their examinations. Teachers need to update their knowledge; and the applications skills. At the same time, students have to be given value education also, because it is far more important to be a man of values than a man of success. If scores are important for living, morals are important for living well. 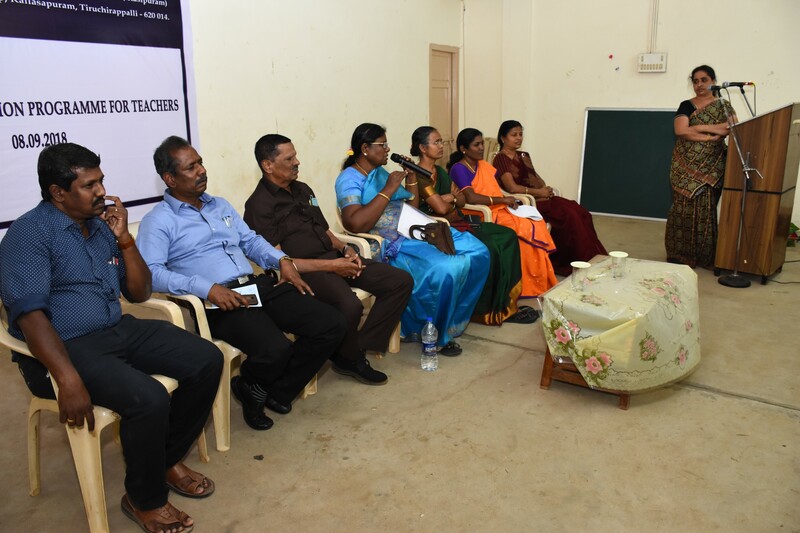 In the afternoon Mrs. C.Jayalakshmi, Dean Counselling, Paavai Institutions spoke on the topic, “Teachers are Real Parents”. At the outset she made it clear that students provide job to the teachers because “No Student, No Job”. So the teacher should love the students and the job. Risk factor is prevalent in all the fields. Hence the teacher should be bold and courageous to tackle any kind of situation. Teachers need to be a good communicator in order to impact upon the learner. A good teacher should be unbiased. Teachers should never discriminate learners. They should love all types of learners with equal attention and patience. Teachers should teach to reach the students. They should handle the slow learners with extra care and attention. They should teach from the heart and not from the text books. They should be thus students –centric in all aspects. A good teacher is always a friend, philosopher, counselor, mentor, sculptor and a guiding torch to students. The Valedictory Session took place in the evening and Dr. K. Selvi, Dean Academics presented the concluding remarks of the entire programme. She reiterated the fact that success is the result of persistence and patience. The students and teachers should aim at the highest, work for the highest in order to reach the highest. Following that, the teachers gave their feedback and requested that similar programmes should be held for the students as well as for the parents so that there could be hundred percent results along with a good number of ranks and a class of learners getting admission into renowned higher educational institutions. Above all, RSK will have the pride of having created good leaders, respectful citizens with desirable social characteristics. The programme ended with the vote of thanks proposed by Mrs. Joslyn Selvaraj of C-Sector.Earlier. 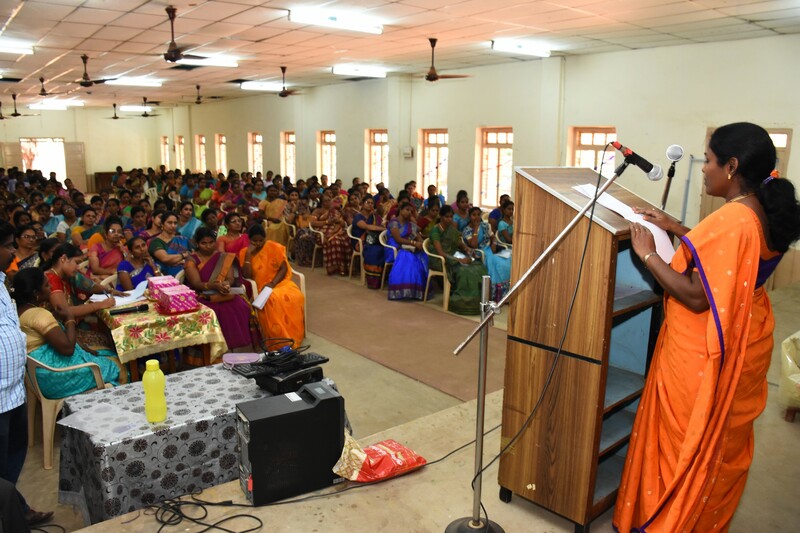 Mrs. Geraldine Joseph, the Coordinator of the B-Sector school welcomed the gathering and around 170 faculty members were benefited by the programme.